Maggie Cheung in Wong Kar-wai’s In the Mood for Love (2000) Image: WWD. This year’s big Costume Institute exhibit, China: Through the Looking Glass, broke the attendance record previously set by Savage Beauty in 2011 to become the Met’s most-visited costume exhibit. (See WWD.) Andrew Bolton’s catalogue, illustrated with original photography by Platon, is available from Yale University Press. Andrew Bolton, China: Through the Looking Glass. Fashion, Film, Art (2015) Image: Yale / Google Books. One of the show’s major draws was Wong Kar-wai’s art direction, with styling by William Chang Suk-ping. (See Rosemary Feitelberg, “Chinese Arts Examined at the Met” or read the press release here.) Like Matthew Weiner’s Mad Men and mid-century American dress, Wong Kar-wai’s In the Mood for Love (2000) and 2046 (2004), with costume design by William Chang, have virtually defined the image of mid-century Hong Kong fashion. 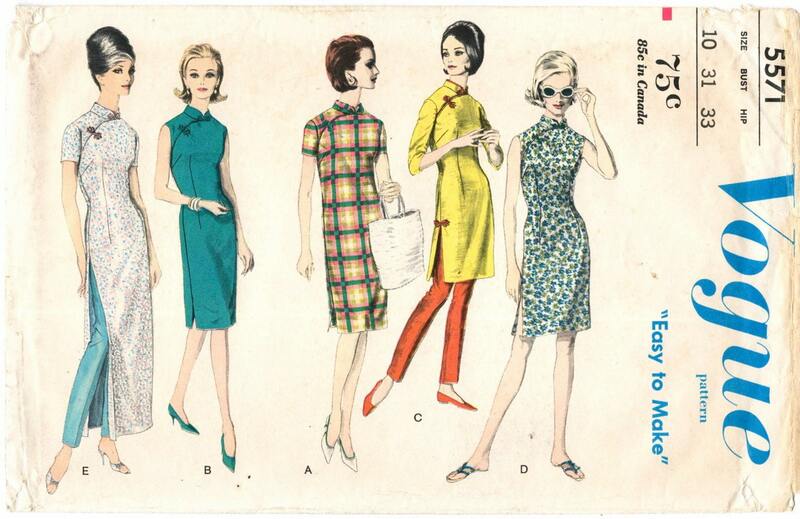 It’s possible to find vintage sewing patterns showing a Chinese influence, especially cheongsam patterns, from about the 1950s on. 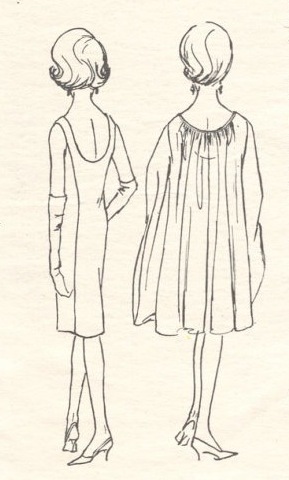 The earliest Vogue patterns I’ve found that show a Chinese influence date to the early 1960s. Vogue 5571 (c. 1962) Cheongsam and slim pants. Image: PatternVault shop. 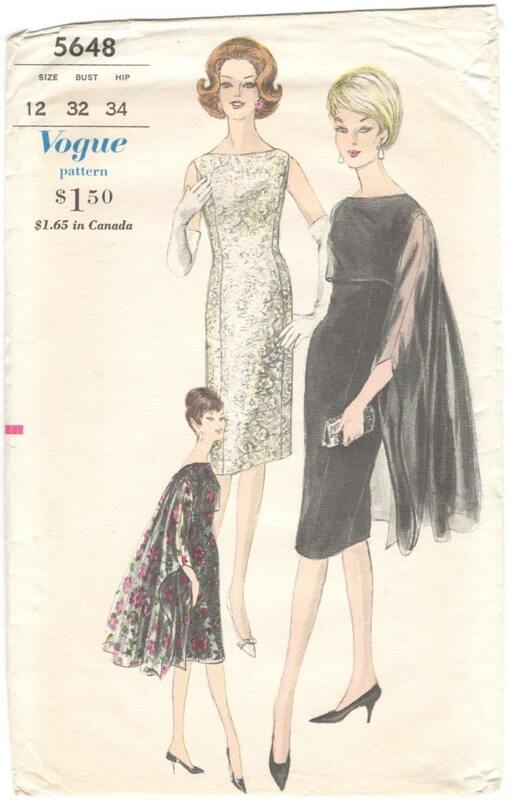 Vogue 5648 (c. 1962) Cocktail dress with ‘Ming’ cape stole. Image: PatternVault shop. Interestingly, although Vogue 5571 is clearly a pattern for a cheongsam or qipao, the envelope text says nothing to identify the garment as Chinese. Vogue 5648, on the other hand, calls its voluminous coverup a ‘Ming’ stole—a garment for which I can find no evidence whatsoever. 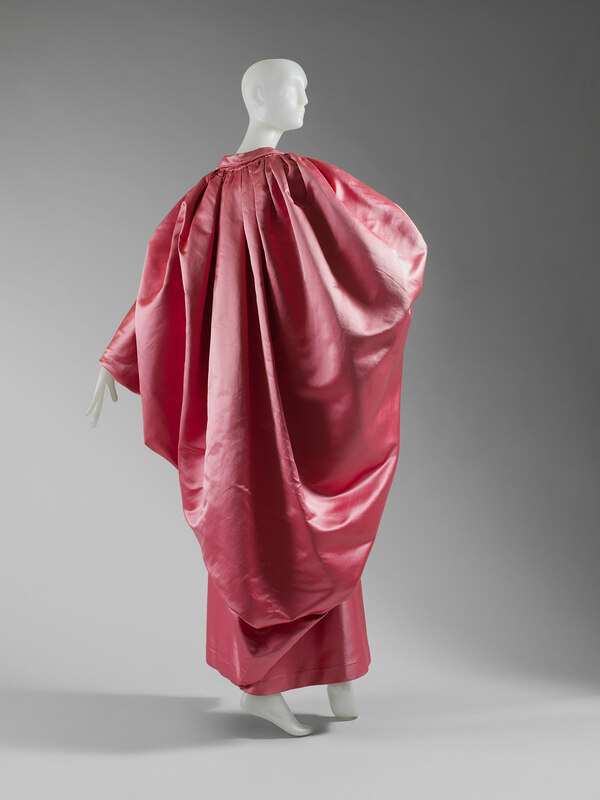 Balenciaga evening wrap, 1954-55. Image: Metropolitan Museum of Art. By contrast, the instantly recognizable cheongsam or qipao is a product of the modern period, a hybrid garment with a complex history traceable to Manchu dress in the Qing Dynasty (1644-1911). Vogue Patterns’ mid-century Chinoiserie seems inseparable from the context of the Cold War. In 1962, it had been just over a decade since Mao’s 1949 proclamation of the People’s Republic of China. The Hollywood films Love Is a Many-Splendored Thing (1955) and The World of Suzie Wong (1960) had helped popularize the cheongsam in the West with their depictions of love affairs between an American man and a qipao-clad Chinese woman in mid-century Hong Kong. 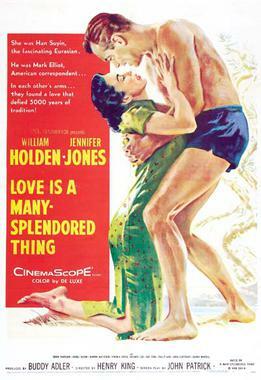 Jennifer Jones wears a cheongsam on the poster for Love Is a Many-Splendored Thing (1955) Image: Wikipedia. Nancy Kwan wears a cheongsam (upper left) on the poster for The World of Suzie Wong (1960) Image: IMdB. Nancy Kwan on the cover of Life magazine, October 24, 1960. Photo: Bert Stern for Paramount Pictures. Image: Google Books. For more on the cheongsam/qipao see Juanjuan Wu, “Reinvented Identity: The Qipao and Tang-Style Jacket,” chapter 6 of Chinese Fashion: From Mao to Now (Berg 2009). What a great post – I love the look of the cheongsam. Thank you for the link! There are a few modern patterns available for the style – Burda did one in the February 2012 magazine and Folkwear have one too. I made the Burda one a couple of years ago and have worn it to death, but I’m slightly put off replacing it by having read recently that it can be considered cultural appropriation for someone not of Chinese descent to wear one. Have you encountered that? Thanks, Catherine! I have a copy of the 60s one myself. As I understand it, the cheongsam was already a hybrid garment by the 1920s, so I’m not sure the cultural purity police have much of a case. I added some links to reviews of the show; Holland Cotter makes some interesting points about borrowing and cultural impurity.